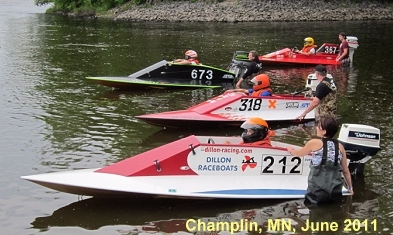 Mini GT is an American Powerboat Association (APBA) Sportsman class raced in Minnesota and nearby states in events organized by the Twin City Powerboat Association (TCPBA). Boat: Production Tunnel or V-bottom, 10' min. The boats are tunnel hulls and v-bottoms, at least ten feet long, and powered by stock 25hp OMC motors with aluminum propellers. It's not complicated, and it's not expensive. Speeds hover around 40 mph. The class is open to drivers (men, women, boys and girls) as young as 10 years old, and there is no maximum age. Mini GT is for everyone! As the 2008 racing season was about to get underway, it became apparent that we would have only three Mini GT drivers, and only two of them could be counted on to make every race. The decision was made by these drivers to upgrade their boats to GT Pro. As a result, there were no Mini GT races in 2008 -- or in 2009. But we did not give up on Mini GT. Since 2007 only production molded boats have been allowed in Mini GT. However, in an effort to bring back the class, the Twin City Powerboat Association board approved the addition of one homebuilt design to Mini GT. That design is the Dillon Mini Vee. In 2010 Mini GT came back with three Dillon Mini Vees. One more Mini Vee has already been built for the 2011 season, and two additional ones may be joining the class as well. 2013: We added a 25hp option to our GT Pro class, effectively merging Mini GT with GT Pro. HOWEVER, Mini GT will remain a stand-alone class as long as there are enough racers to run the two classes separately. See the GT Pro rules for more details. Mini GT will continue to be an excellent entry into boat racing. It is especially suited for the budget-minded, for those who want to keep it really simple, or if you want to get one or more kids into the sport. If you are interested in becoming a Mini GT or GT Pro racer, or want to know more about powerboat racing in general, please feel free to contact me with your questions. The TCPBA is a wonderful bunch of men, women and youngsters. We have hard-charging competition on the water at speeds from 40 mph to 130 mph, and geat comraderie and cooperation on the shore. The goal is to have safe, competitive races, and just plain fun. Minimum Weight -- 600 lbs. New drivers under 12-years-old will be required to take a minimum of 3 driving school sessions (to be conducted on race weekends) that include at least 5 laps on a race course by themselves. Driving school is allowed for drivers 9 years of age although they will not be able to compete until age 10. After completing 3 driving schools, driver will be on rookie status until released by a referee. a) Any 2-cylinder, 25 horsepower Johnson or Evinrude built from 1985 through 2005. Also, 20 horsepower Johnson and Evinrude motors (built from 1985 through 1999) may be upgraded for the class by replacement of the intake and carburetor with parts that are compliant with the aforementioned 25hp motors. Blocks from any 31.8 cubic inch OMC/BRP powerhead manufactured from 1976 to 2005 may be used, although 25hp intake and carburetor must be used. d) An ignition interrupt switch attached to the driver via tether is required. c) Drivers must remain in a sitting position at all times, in a seat securely fastened to the hull, and use a foot throttleand steering wheel. d) Junction of seat and seat back may not be more than 36" rearward of midships. b) Cupping, re-pitching and removal of material is permitted.